Trigger finger in rheumatoid arthritis (RA) is a common visible effect of the disease. Fingers, to varying degrees, become stuck in a bent position, as in pulling a trigger. The joints are not actually fused when this occurs. But the tendons get caught in a tendon sheath (or pulley) due to swelling or nodules that inhibit movement. Inflammation of the synovial membrane around the tendon is called tenosynovitis. Trigger finger is sometimes referred to as stenosing tenosynovitis. If you are a person living with rheumatoid disease (PRD), you have probably noticed joints catching or resisting movement, and possibly had it explained away as just “RA stiffness.” But the cause of RD /RA stiffness is not known, and it is likely related to tenosynovitis. My occupational therapist explained the progression of stiffness to me recently, as she worked to increase my elbows’ range of motion: the soft connective tissues swell and can gradually stiffen, then eventually become firmer, limiting movement and finally preventing it. The American Society for Surgery of the Hand (ASSH) has good images explaining a normal pulley and tendon in a finger, and what happens when the tendon cannot glide through the pulley. 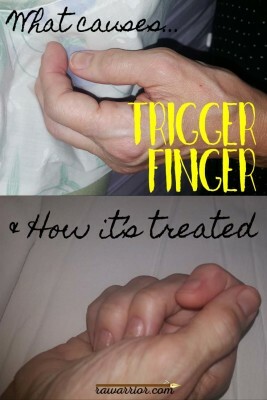 A trigger finger splint prevents the finger from “triggering” during the night so that it won’t be as locked up in the morning. Trigger finger injections reduce the inflammation so the tendon can move more freely within its sheaths. For decades, steroid injections have been the common treatment for trigger finger in rheumatoid arthritis and injections have been shown to be very effective for trigger finger. Oral anti-inflammatories (NAIDS and steroids) may also be tried especially if many tendons are affected. However, if the problem persists, as it can when RD / RA is very active, then trigger finger surgery can be an option to release the tendon. 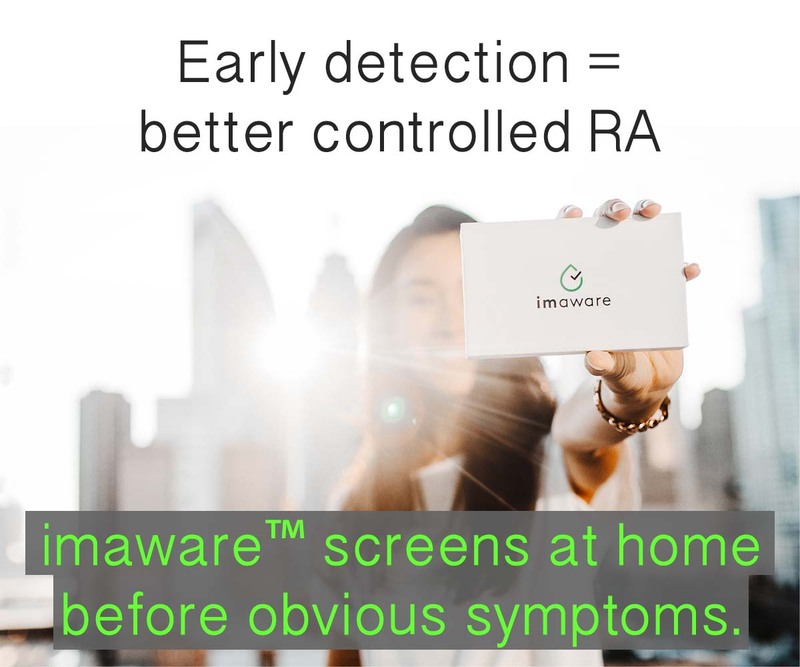 Of course trigger finger can occur in people who do not have RD / RA since inflammation can be related to other causes such as over-use. I would have been shocked to know my future when I first saw pictures and read about trigger finger in rheumatoid arthritis in 2006. Like everything else, trigger finger was supposed to be only in late stage disease. And only before modern medicine. It was supposed to be in someone else. As I’ve explained before, we’ve learned in working with many thousands of patients, that rheumatoid disease doesn’t necessarily strike the hands first. However it does seem to always eventually target hands. Like the cervical spine, hands are affected because the joints are small and they are most frequently moved. My first trigger finger occurred nine years after diagnosis, in early November 2015, immediately after I had been scribbling many notes to my attorney during a long day in court. Actually I can tie every progression of my disease to specific events of joint use or injury / trauma. During the couple weeks after that court date, I took videos in the early morning with my phone because I was amazed that my finger now had a mind of its own. As with every other symptom of my disease, it spread – to other fingers. This “spreading” and symmetry is part of what makes rheumatoid disease unique. There is a mistake in the immune signals that communicate about the injury to other parts of the body. I’ve had countless injections for trigger finger – I have actually lost count. To make this report complete, I will share with you two things. 1) Trigger finger hurts. My finger joints hurt. The injections hurt. And trying to force my fingers straight, which sometimes works and sometimes not, hurts. A lot. 2) People, even good doctors, seem oblivious to trigger finger, as with many aspects of RD. In the past year, while I’ve lived with ten trigger fingers, yes all 8 fingers and both thumbs, I’ve had two doctors say about my RD: “But you can still make a fist, right?” So, I wake up every morning with my hands in fists that won’t open, which means I have spent half of the last year with my hands stuck in fists – and I still get the same dismissive question that is supposed to prove I’m doing fine: But you can still make a fist, right? 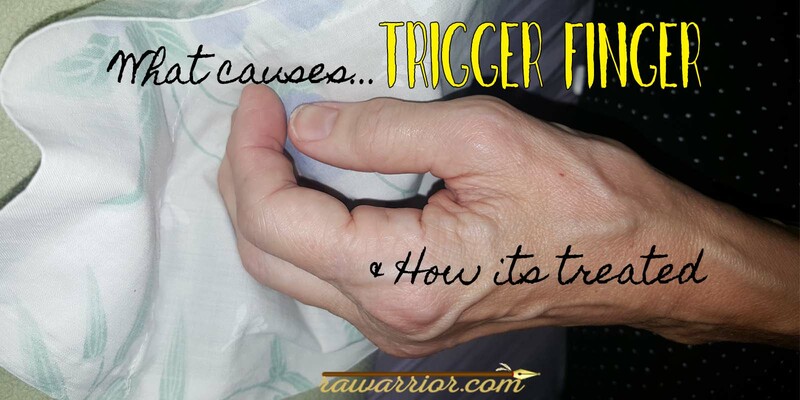 HAVE YOU SEEN TRIGGER FINGER IN YOURSELF OR ANOTHER PERSON WITH RA /RD? IS STIFFENING OF SOFT CONNECTIVE TISSUES LIKE TENDONS A PROBLEM IN RA / RD? Note on the great Dartmouth video: Dr. Kerrigan uses the term “tendonitis” in the video in 2009. However in recent years the more common term is “tenosynovitis,” because a distinction can be made between inflammation of the tendon itself or the thin synovial membrane around it as is common in RA / RD. ← What Causes Rheumatoid Arthritis Pain? Best care for my trigger finger has come from my family practice doc. HIs skills and knowledge are completely sufficient, and he takes a little more time, pays a little more attention than specialist such as an orthopedist, even though rheumatologist (excellent physician, this is not a complaint) seems concerned about PCP doing this work for me. I’ve had more in 2nd, 3rd, 4th fingers, on an off since early 1990’s — long before RA diagnosis circa 2003. Keyboard work was definitely an aggravating factor to most occurrences. Family doctor is nearer to my home and more accessible and less costly than specialist for care. So many crazy things with ra/rd I have had issues with my elbow it happened gradually and I must have adapted until I went and seen a new dr and he asked how long my arm had been contracted like that? My arm was parallel to my body and I had not even noticed. I responded really well to steroids and was able to reverse it. I hope u have the same luck. Are you saying that the locked fists I wake up with many mornings is trigger finger? I was diagnosed with RD in 2008. During flares my hands are tightly balled fists when I wake up and it takes some work to get them loose and open. It feels as if the knuckles are locked in place. I’ve mentioned this to my rheumy before and they didn’t seem to care much about it. I have it in both thumbs, so far injections in both, 2 on my writing hand. I wear braces at night and during the day if they feel like they are ‘acting up’. I have 3 different sets of braces for my hands/wrists – for differing occasions of pain levels. It gets old in a hurry, for sure. I got the official RA/RD diagnosis April 21, 2014.. just 3 years ago! So fairly new to all of this!! I did have a trigger finger before that and thankfully it cleared on its on.. however I still have that achey feeling at the base of that finger and worry it will start up again!! So many things to be concerned about and nobody to talk to!! God bless you for all you are doing!! Without you out there, where would the RA/RD Community be!!! Take care of yourself and Roo!!! Been praying for you all!!! What a timely article for me as my left palm is full of corded knots. The rheumatologist refused to inject my hand this week stating that the structure is so tight that if he pierced it with a needle to inject it could tear the tendon resulting a emergent surgery vs. the planned surgery he wants me to have. I also have carpal tunnel syndrome in both hands. I am going to bypass my scardy-cat Rheumatologist and see my ortho for injection evaluation. I do not make a good surgical patient due to diabetes. This topic is so timely for me! I spent 2015 with trigger finger and had no idea what to do! I saw the primary and had X-rays and said that it was due to arthritis, gave me a NSAID. Done…In 2016, an NP suggested that I see a Rheumatologist (pos ACCP). The rheumatologist said that it was due to arthritis. Yesterday, my new Rheumatologist said, “oh that’s trigger finger”. By the way, he spent two hours with me and is re-evaluating me for RA. I was diagnosed last year but want a second opinion after my experiences with Dr. Do-little, I I . This is my favorite site and it has helped me cope! Thank you! My left hand was in a fist complicated by ulnar drift. I had four joint replacements. The results are not perfect, but the pain was diminished. I have just been recently diagnosed with this fun disease. 2 years ago I woke up and there were huge lumps on my hands. Very odd. No pain. I thought I popped something playing with my dog. (yes I’m serious) Then my whole hands blew up and I couldn’t use them! yikes! So I went to my primary Dr. and she said, “boy you get some strange stuff happen to you”. yup. so she had no damn idea what was wrong with me. prednisone. That made me just feel awful. I went back to her and told her what it was doing to me and she said, hmmm… can you pee in this cup? Sure, why not. Off I went. Now, my symptoms were, constant urination, extremely blurred vision, and last but not least I couldn’t stay awake. I hit a car because I fell asleep while sitting in traffic. Ok. so she come back into the room and says welp you are diabetic! WHAT?! How? UGH!! Still have no idea why I cannot use my hands mind you. So off to the endo I go. Got all kinds of neat meds. Yikes. Oh and she took blood to test for all kinds of fun stuff. One of the tests was RA. Came back negative. Cool. She suggests I go to see an ortho for carpal tunnel. k. he sends me for all kinds of neat tests. Says you need surgery. uh no. He says but I want you to see a Rheumatologist first to rule out RA because if you have that then that’s probably what is causing all of this inflammation. k. Go see RA doc. He tests me for RA too but says it’s just a formality because you are text book. k. Here goes more meds. I was so overwhelmed I was in tears when I left that office. I was 48 years old and called my mother crying! After she calmed me down I realized I can do this. 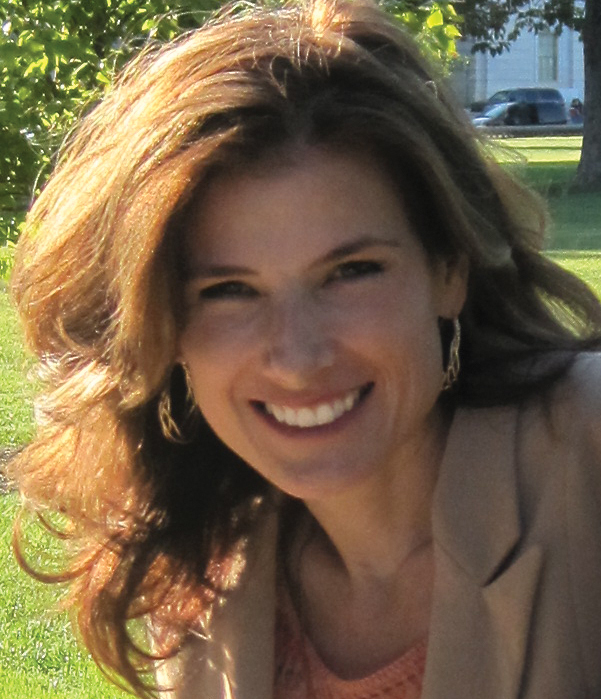 I am 50 now and boy let me tell you, God is testing me! I am at my wits end. Methotrexate caused issues with my liver. Now I have a liver specialist. oi. I am now on orencia and am in the middle of a huge long lasting flare. Everything in my body hurts. Joints I didn’t even know I had are hurting. Fat little fingers. Still have to work though because, well, bills don’t pay themselves. So here I am today changing my whole life to get rid of this God awful disease as well as diabetes. I am changing my diet, because of course I’m fat. I am have been listening to pod casts and learning what to eat and how to be healthy. So here goes another journey!! To my RD friends I have found an amazing product made from Kannaway. The CBD Oil sauve starts to reduce my inflammation in 15 minutes or less. It can’t fix our joint destruction, but it helps with inflammation anywhere on your body. Trigger fingers do not happen since staring this product. Please look into this Kannaway Company…it’s amazing. Please DM for more information. I have that problem in my right thumb, it always happens when I’m working and you can’t do a darn thing about it until it decides to loosen itself up! My trigger finger is always just swollen up like a balloon and can’t extend out straight or make a fist. And the radiating pain makes it hard to hold a pen or carry heavy objects. My first trigger finger was at age 16. Two steroid shots and surgery fixed it…for 2 years. Then another round of shots and another surgery to completely cut the tendon. Biopsy shows tissue had rheumatoid factor. Rheumatologist said no way I have RD. Fast forward another 4 years to the age of 22 and another trigger finger surgery. Once again, biopsy shows rheumatoid factor. That is how I was diagnosed 7 years ago. My bloodwork has never shown a positive RF but those two surgery biopsy did, and I have all the symptoms. 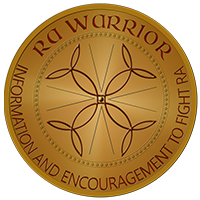 I was diagnosed with RA/RD March 2017. Mine started with both left and right Carpal Tunnel syndrome. I had the release surgery done and was overwhelmed with how great the results were. I had so much pain with CT. I couldn’t sleep for more than an hour straight. I kept getting up to shake my hands and arms out to no real relief. Daytime was difficult, too. As I was healing my hand surgeon noticed a lump on the top of my left hand. It was very painful, but I thought it must have something to do with my surgical healing, perhaps extra pressure was put on the top of my hand while the doctor did my Carpal Tunnel Release surgery. He detected it as synovitis and suggested I see a Rheumatologist asap. I did and here I am now with a disease I never had heard of before. I also acquired 3 trigger fingers within a few weeks. Steroid shots have helped them a lot. I have lots of other stiff going on, but I’ll stick to the topic here regarding hands. Thank you for your very informative website! Blessings to all. I had 5 trigger fingers on my left hand released about 8 years ago and just had 2 injected on my right hand a month ago. It has help. I have had 4 knee replacements and a hip. My hands and feet are bad. I’ve had w shoulder surgeries for impingements. My back and neck as well as elbows are very painful. I’ve had numerous back and neck injections. I am on narcotics to allow me to keep moving.I’m on simponi and Arava. I also have fibromyalgia. My breathing has gotten much worse and I am told will continue to do so. I also have IBS, another autoimmune disease. Don’t know what else can fail! I’ve had ra since 4 years now. First discovered and in my right hand in my index finger which took me awhile to find out that it was RA. Finger feels like it keeps getting worst can’t take the pain anymore seriously thinking about surgery does anybody have any ideas? did anybody do it ? how did it go? Let me know thanks god bless you all.. So I’m only 15 and I was diagnosed with trigger thumb and will be getting surgery next month. I’m just wondering: is this considered a type of arthritis? I have been dealing with a very fast moving RA within the last 3-4 years. I can’t tell you how much this site has at least given me hope that what I have been telling my RA doctor about my symptoms is real. Why do RA doctors seem to just blow off what you tell them? There are so many symptoms to this disease. I am no longer working now recently because of my condition.